The March meeting was held at the Red Dragon. 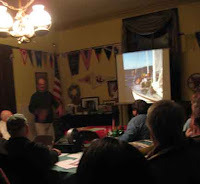 Rick Carrion spoke about the Classic Yacht Restoration Guild, Inc. and Elf, an 1880's racing cutter. In the MIT Archive B&W photo, Elf is racing with Beatrice (black hull) up in Mystic. Last year I was able to help build the new rig for Elf at the Workshop on the Water.